Posited: Great puzzle games share two primary characteristics. One’s seemingly coincidental, the other’s mechanical. 1) Great puzzle games have one-word titles. Think about it: Myst. Portal. Braid. Machinarium. Limbo. Fez. Room and its sequels. The Witness. (Okay, fine, this one has a definite article. I blame Lucas Haas.) One day, maybe, Miegakure. 2) Great puzzle games literally bend your brain by employing an unfamiliar cognitive process, some form of spatial or temporal thinking that at first feels disorienting, but slowly becomes second nature. The first time you use Portal‘s gun to aperture your way to science, you have no idea what you’re doing—okay, so if I walk through this hole I come out all the way over there?—and by game’s end you’re daisy-chaining your free-fall momentum in order to solve a puzzle. Fez and Braid also do this incredibly, with Fez coaxing Paper Mario‘s perspective shenanigans into something more transformative. And now there’s Gorogoa. Like my favorite puzzle games, Limbo especially, it completely snuck up on me; I hadn’t heard of it before the day it came out and I read this great Chris Kohler story detailing its development. One man (who was himself inspired by Braid), seven years, and a mechanic I’d never seen before have added up to make one of 2017’s most surprising—and indelible—games. 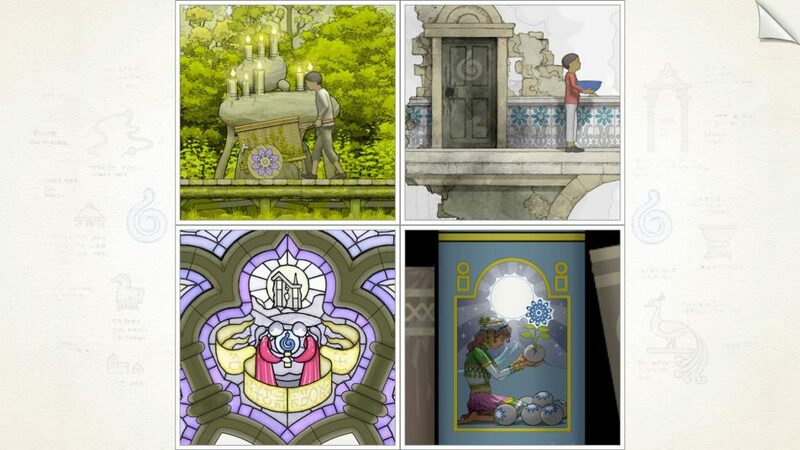 I’m afraid to rob you of even a moment of the game, so I’ll just say that Gorogoa is told through images on four sliding tiles. Sometimes those tiles portray four different scenes, sometimes they’re unified to present a single tableau. Sometimes a tile will include a doorway or other such frame, and you can zoom through that frame to get to a tile hidden behind or inside the original tile. It’s by manipulating those collapses, those wormholes and distortions, that you get from goal to goal. It’s not a long game, but it’s not forgettable either.